2014 was a busy year for Recipero with our customers checking over $4 Billion worth of devices using our solutions. 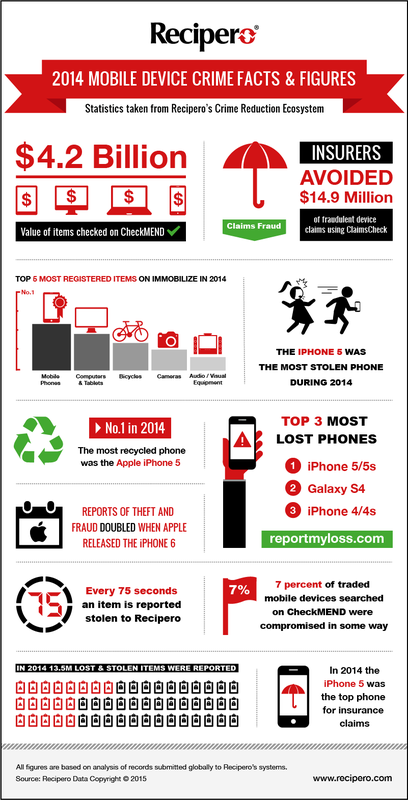 We have pulled a few more more facts and figures from our Crime Reduction Ecosystem that are summarised in the attached infographic “2014 Mobile Device Crime Facts and Figures”. To learn more about Recipero’s Crime Reduction Ecosystem and our solutions that contribute to it, please visit our main website at www.recipero.com. South Yorkshire Police have reported that a stolen mobile phone that had been registered on the national UK database, Immobilise has resulted in the arrest of a man in Doncaster. A Twenty five year old man was arrested on Tuesday, 28 September for being drunk and disorderly in the Town Centre. He was brought into the police station by Acting Police Sergeant Sharon Wood and PC Steve Roberts from the Town Centre Safer Neighbourhood Team. They checked his mobile phone against the Immobilise database and it was identified as being stolen. He admitted he had stolen the phone from a pub in Thorne last year, which when they checked had been reported to the police at this time. He was charged with theft and drunk and disorderly behaviour. Police are hoping this result will encourage more people to register their belongings with Immobilise. It is the UK’s national property register, which allows people to create secure and private portfolios online for their personal property. It is not just phones that can be registered any belongings that have a serial number including electrical items such as televisions and cameras can all be registered. We hope this result will encourage people to register their property on the Immobilise database. If this phone hadn’t been registered it would have been very difficult to know it was stolen and reunite it with the owner. Police officers in Doncaster have also been targeting shops across Doncaster including CEX, Cash Generator and small mobile phone shops to check for any stolen mobile phones. Officers use scanners to scan the barcode on the back of the phones, which retrieves data from the IMEI number, and states if the phone is lost, stolen or blocked. Registering goods also acts as a deterrent to opportunistic thieves as they are unable to sell stolen property as easily if it has been registered. We will continue to do these checks and identify any stolen property. 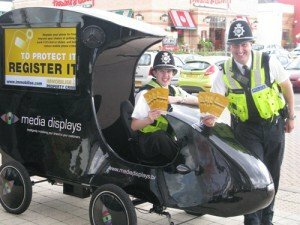 BBC news yesterday reported that the West Midlands Police in Dudley have just unveiled a new tool in their drive to reduce crime. The device is a four wheeled pedal powered “Digi-bike”, providing a multimedia message to passersby, broadcasting Bluetooth and video and audio messages from its screens and speakers. One of the key crime prevention messages that the digi-bike is promoting is the registration of your valued property on the Immobilise National Property Register (www.immobilise.com). Today July 23rd it was officially agreed that CheckMEND would be the first approved due diligence service to be used and officially endorsed under a new Home Office/recycling industry code of practice. 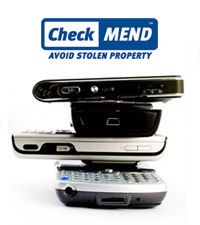 The signing of the new code of practice by over 90% of the mobile phone recycling industry means that for the first time there are agreed guidelines for the checking of handsets offered for sale to the industry and this includes using the CheckMEND service to check the National Mobile Phone/Property Register. This is a major step forward for the industry and CheckMEND and we are really pleased the industry has recognised their responsibilities in checking products they are buying, this model needs to be extended to all handlers of used goods and retailers taking trade ins and we will be pushing for this to be the case, but this is an excellent start. South Gloucestershire Police have been peddling cycle security to children in the run up to a force-wide operation encouraging people to mark their property to deter thieves. 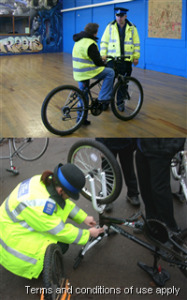 The neighbourhood Police Community Support Officers visited Patchway Youth Club and Filton High School and helped the young people to mark their bicycles. Bike theft is one of the most commonly reported crimes. Bikes are worth a lot of money, so invest in a good-quality lock and use it. Marking your bike with your postcode does deter thieves, because it means that police can prove it is stolen. You can also register it for free at www.immobilise.com, a secure property database checked by police across the country. On Saturday December 12 2009 PCSO Rob Hendra visited Patchway Youth Club. He helped youngsters aged between nine and 13 to mark their bicycles and register them on the immobilise website. Avon and Somerset police are encouraging people to mark their property with a day of events under Operation Relentless today (Thursday December 17 2009). While South Gloucestershire is a safe place with low crime levels, people mustn’t be complacent about security. Most of our reported burglaries are from homes which have been left insecure. Most thefts from cars are when property like a sat nav has been left on view, and thefts of bikes which have been left unlocked. Criminals are opportunists – let’s not give them that chance. Officers are running bicycle marking events throughout December and January – and offering the chance to win an £150 voucher towards cycling accessories. Visit www.avonandsomerset.police.uk/cyclecompetition for more details. The competition closes on January 31 2010. Beat the burglars – protect your presents! Police in Bristol are giving Christmas shoppers the gift of burglary prevention as part of the forcewide Operation Relentless day. Officers in the new “cop shop” at The Mall Bristol, in Broadmead, are inviting shoppers to stop by and have their Christmas purchases registered on a national property database, called Immobilise. At this time of year people are thinking about getting the last bit of Christmas shopping done and all other things festive. But if someone was to break into your home and steal all those presents Christmas would be ruined and you would be very out of pocket. Items that can be traced and identified are harder to sell and far less attractive to thieves, so registering on Immobilise can be a deterrent, and if the worst did happen it may help us to reunite property with its rightful owner – if recovered. We want people to take steps to stop themselves becoming victims of burglary. 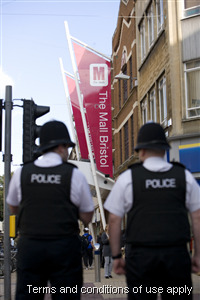 Visiting our officers in The Mall Bristol or at Curry’s in Channon’s Hill and registering on Immobilise is a good start. There are also all sorts of additional tips and advice we can give to you on other ways to make your home, and everything in it, more secure – so come and see us. Immobilise is easy to use and completely free. It is the only national property database that will throw up results through Avon and Somerset Police’s standard checks on recovered stolen property if the items have been registered. It is also a deterrent to thieves because items that can be traced and identified are harder to sell and can be less attractive to thieves. To use Immobilise anyone can visit the website www.immobilise.com and open an account and put details and serial numbers of items like laptops, cameras, mobile phones and bikes into the account. More than 450 homes were visited by the team who spoke to residents about what steps to take to take for a crime-free Christmas. People at home were reminded not to tempt thieves by keeping presents out of sight, making sure their house is secure and that empty houses looked occupied by leaving a television or radio on and using timer switches on lights. The day of activity, on Wednesday 9 December, was undertaken in partnership with Devon and Somerset Fire and Rescue Service who spoke to residents about fire prevention this winter. Residents were asked to ensure smoke alarms were fitted and working, reminded not to overload power sockets and advised to check their Christmas tree lights before putting them up. Where there was no answer at houses an advice leaflet was posted through its door. Christmas is a special time for people to relax and enjoy spending time with family and friends. Becoming a victim of crime at Christmas can spoil the festive period so we have been out reminding people how to avoid being targeted this year. The message was well received by the residents we spoke to and I am confident most will act on the advice we gave. Make sure ladders and tools are secured otherwise a thief could use them to break into your home. ChiswickW4 has reported that a man who was found in possession of a bike that was stolen from Chiswick has today, Friday 4th December, been convicted at Isleworth Crown Court. 36 year old Hampsted resident Rocky Taylor was found riding a bike that had been stolen from outside Turnham Green Tube Station in November 2008. When officers from Turnham Green Safer Neighbourhoods Team searched his flat, they found numerous cycles and parts. Computer analysis linked Mr Taylor to numerous internet advertisements for second hand bikes. Some of these bikes turned out to be stolen from burglaries and from the street. A lengthy investigation led to Mr Taylor being charged with several offences of being in possession of criminal property, to which he pleaded guilty at an earlier hearing. Taylor was sentenced to a total of 6 months imprisonment, which was suspended for two years. As well as this, he was ordered to undertake 200 hours community work and pay £750 costs. Taylor was also prohibited from using, buying or selling cycles and cycle parts for a period of two years. What began as a simple bike theft in Chiswick led us across London and uncovered an Aladdin’s cave of bikes and bike parts. We will continue to target cycle thieves in Chiswick, and we will endeavour to prosecute those who trade in stolen goods. It is worth noting that the cycles we were able to return to their rightful owners quickly were all registered on Immobilise. By registering your cycle, we are able to get it back to you and it helps us to prosecute criminals, as it can help prove that the goods were stolen and not bought legitimately.